While East and West Coasters may think themselves the pinnacle of technological progress, it’s Middle America that leads the way in going “all in” on mobile adoption. People hugging the coasts get the best broadband, but they’re laggards when it comes to abandoning their landlines for mobile phones. And maybe, as a new Pew Research report highlights, it’s because the more affluent coastal communities can afford to keep talking on their landlines, while the young and poor choose to save money by going mobile. 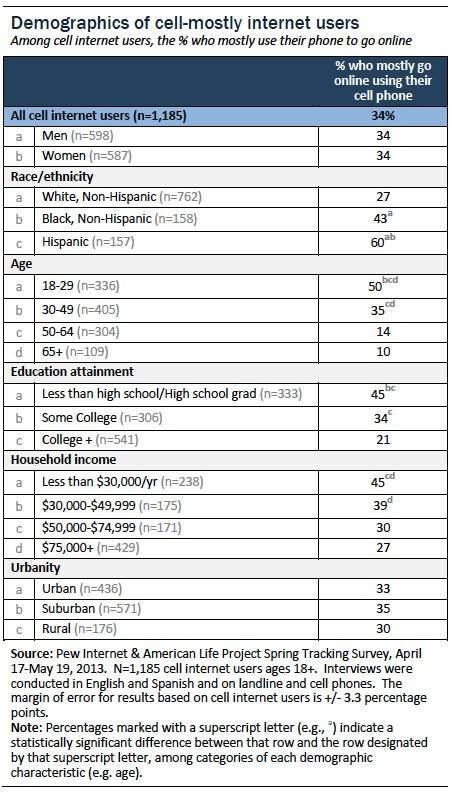 Still, given that nearly half the U.S. households are considered “poor” or “near poor,” and demographically look different from the average app developer, do app developers risk missing half the U.S. population? Each year the percentage of households embracing mobile while cutting their landline phone service keeps rising. This makes sense; the need for a landline phone keeps diminishing even as the utility of mobile phones keeps increasing. In my home, we keep a landline phone solely because my wife and I need to be able to reach our youngest kids when we’re not home, and we don’t want to give them mobile phones. Plus, the “home phone” serves as a convenient place to send telemarketing spam. 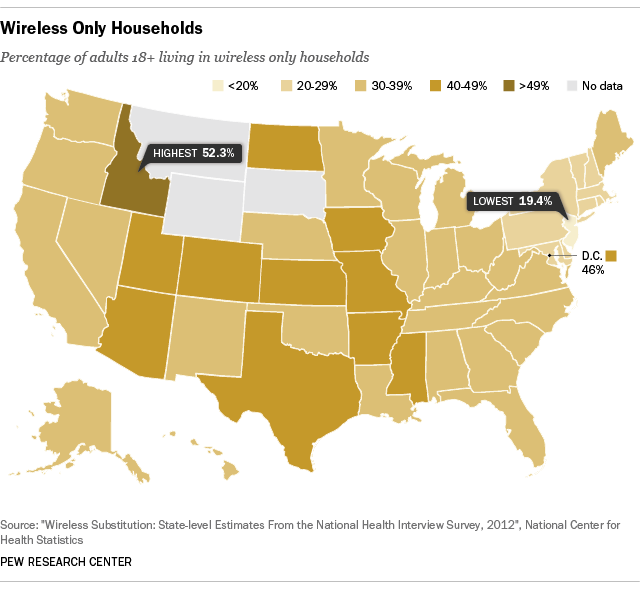 But “wireless-only” or “wireless-primary” households aren’t exactly evenly distributed. As reflected in data from the National Center for Health Statistics and the Centers for Disease Control (CDC), wireless-only households tend to be young, poor or both. In fact, 54.7% of adults living in poverty (i.e., household income of $23,850 for a family of four) lived in a wireless-only household, compared to 47.5% of “near-poor” (i.e., household income greater than $23,850 but less than $47,700) adults. These two income categories comprise roughly 50% of the U.S. population, so it’s not an insignificant market. It may, however, be grossly underserved. Do Mobile App Developers Reflect Mobile App Users? So we may have rich, young twenty-somethings building apps for other rich, young twenty-somethings, ignoring the Middle American poor. Or not. Despite anecdotal experience with Silicon Valley’s youthful developers, the typical mobile app developer—asEvans Data has found—is actually a highly educated male in his mid-thirties with several years of app-development experience and a few kids. While this doesn’t match the Silicon Valley “brogrammer” type, it’s also not reflective of the typical wireless first household. In fact, as Slate reports, there’s even a clear developer divide between Android and Apple’s iOS. Through a series of heat maps, it becomes clear that the rich use iPhones and the comparatively poor use Android. Developers target apps for iOS in part because that’s where the money is and, frankly, in part because that’s likely what they use, given their own demographic profiles. Do The Poor Need Apps?  Which may leave half the U.S. population without anyone really bothering to write apps for them. How can this be a good thing? It’s not merely a matter of commercial developers, either. Tim O’Reilly recently talked about the mismatch between technological progress and government (“Technology and Trust: The Challenge of 21st Century Government“). Governments are failing to bring essential services to citizens through convenient media. This cuts particularly hard against the poor who, again, tend to primarily access the Internet on their phones. Sure, this isn’t new, and it’s not necessarily fair to call out app developers for not writing code for an audience that won’t necessarily be able to pay them. It’s not as if app developers are raking in the big bucks, after all. But it’s still troubling that app developers so poorly reflect the demographics of roughly half the U.S. population, and hence are unlikely to code for their needs. Do you agree this is a problem? Why or why not? I’d love to hear your thoughts, as well as suggestions as to how to ensure app development meets a broader swath of needs.